Radiation damage for silicon detectors. The extremely hostile radiation environment where detectors operate require a wide knowledge of radiation effects in order to assess the performance degradation of particle detectors inducted by radiation damage. The very high reaction rate and also beam induced background put stringent requirements on the radiation hardness of the basic detector components. The tracking devices are exposed to large fluences of damaging radiation and have to retain a minimum SNR for efficient particle detection. The main effects due to radiation damage can be summarized in two classes : bulk damage and surface damage. The former are usually caused by the displacement of crystal atoms while the latter include all effects in the covering dielectrics and the interface region. On a macroscopic scale, damage in solid state detectors causes: an increase of a leakage current translating into an increase in noise, a changing in material resistivity, the reduction in the amount of collected charge due to the charge carrier trapping mechanism and the decrease of the carrier’s mobility and their lifetime. Therefore, the SNR decreases with progressing radiation damage. As far as read-out electronics is concerned, it was found that the degradation of the parameters of bipolar and MOS devices is caused by radiation induced surface effects at the Si-SiO2 interface, as well as by defects in the bulk. Below these effects are briefly summarized. Bulk damage is caused by interaction of the incident particles with the nuclei of the lattice atoms. In contrast to ionization such interactions are not reversible in most cases. To remove a silicon atom from its lattice position a minimum recoil energy Ed of about 25 eV is required. Electrons need an energy of at least 260 keV in order to provide such a recoil energy in a collision, while protons and neutrons, because of their higher mass, require only 190 eV. When only small energy is delivered to the recoil Si atom isolated displacements are created, leaving a single vacancy-interstitials pairs. They are created mostly by electromagnetic radiation of low energy electron and x-ray photons. If the recoiling silicon atom gets enough energy through the collision, it can cause further defects. A recoil Si atom needs about 5 keV of energy to displace other Si atoms in the crystal, creating a dense agglomeration of defects (). Since these displacements are closely situated, most of them repair and only 2% of all generated defects form electrically active states. Such disordered regions are referred to as defect clusters. Defect clusters have high local defect density and can be tens of nanometers wide. They have more critical effect on the properties of semiconductor devices than point defects. To be able to compare the damage caused by the different types of particles with different energies, radiation damage is scaled with the non-ionizing energy loss (NIEL). This quantity summarizes all energy deposited in the crystal which has not been used for the fully reversible process of ionization. The equivalent fluence of 1MeV neutrons are used as reference particles. where α is called the reverse current damage factor. After irradiation the leakage current anneals with time according to a process called annealing current which causes the cancellation of the damage into the lattice. The fluence dependence of effective doping and of the full depletion voltage are plotted in the Figure1 (b). Starting with n-doped material it decreases up to a certain fluence of the order of Φ = (2–5)x10^12 cm−2 at which the space charge almost vanishes. With further irradiation the absolute effective doping concentration increases again dominated by acceptor-like defects with a negative space charge. The depletion behavior is now like in p-material. Finally, such defects could also act as trapping centers affecting the charge collection efficiency. The trapping is due to the different time constants of the electron capture and emission processes. Traps are mostly unoccupied in the depletion region due to the lack of free charge carriers and can hold or trap parts of the signal charge for a time longer than the charge collection time and so reduce the signal height. For most of the tracking devices used in particle physics this effect is much less of a problem than the other radiation-induced effects already mentioned. After a fluence of 10^14 neq/cm2 about 90% of the generated charge in a 300 μm thick detector can be collected. However, this number decreases to about 50% for 10^15 neq/cm2 and trapping will eventually limit the use of silicon detectors for fluences much beyond this number. In spectroscopic applications trapping causes serious degradation as it affects the pulse height. Devices exposed to radiation, like satellite-based x-ray telescopes, have to be frequently recalibrated to take into account the effects of radiation-induced trapping centers. In silicon the surface region is also sensitive to radiation. The term surface damage summarizes all defects in the overlaid dielectrics, e.g. the silicon oxide, and the interface between the silicon and the dielectric. As the crystal structure of silicon oxide is highly irregular, displacements of single atoms due to irradiation do not lead to macroscopic changes. Ionization in the oxide, however, is not fully reversible and may cause steady changes of the interface properties. After a sudden creation of electron–hole pairs in the oxide layer, caused, e.g., by ionizing radiation, most electron–hole pairs recombine immediately. As electrons have high mobility in the oxide (μn,oxide ≈ 20 cm2/(Vs)) they will be collected by any positively biased electrode close by. The holes have a very low mobility in the oxide (μp,oxide ≈ 2x10^(−5) cm2/(Vs)) because of a large number of shallow hole traps. They move very slowly in the direction of the electric field in the oxide, hopping from one shallow trap into the next. If the holes arrive in the transition region between silicon and oxide, where many deep hole traps exist, they may be kept there permanently. These charges which are now fixed represent an additional contribution to the total oxide charge Nox, which leads to an increase of the capacitive coupling between pixels. Direct consequences are the greater charge collection sharing between pixels and an increasing noise due to the rise of the capacitive load seen by the electronic readout. Some part of the stuck holes, i.e. those that are closest to the interface, may recombine with electrons mounting from silicon. The electrons reach the oxide volume by the tunnel effect which reduces the amount of positive charge trapped in the oxide. The probability of tunneling electron jump increases exponentially with decreasing thickness of the concerned oxide volume. Thus, the thin oxide of a deep sub-micrometer MOS transistor is intrinsically more radiation tolerant than thicker oxides used in past technologies. For gate oxide thicknesses above approximately 20 nm, the shift of threshold voltage after irradiation ΔVth is proportional to the squared value of the oxide thickness ΔVth --> tox^2. On the other hand, the threshold voltage shift below 20 nm decreases even faster approaching the dependence ΔVth --> tox^3 at the corresponding irradiation dose. 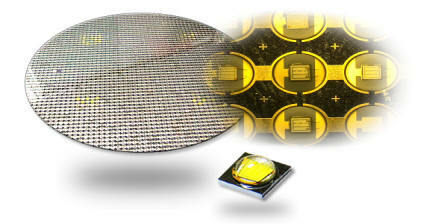 Standard bulk CMOS processes use p-type substrate wafers, and accumulated positive charges may provoke short circuits in the design. The effect is strongly enhanced under thick oxide regions, where leakage currents appear close to the interface. Shallow surface channels can be created between different n-type regions implanted on the chip if they are separated only by lightly doped p-type silicon. Moreover, the charge accumulated at the ends of polysilicon gates of designed in a classical rectangular form NMOS transistors may prevent them to be switched off completely. This is why, the use of enclosed NMOS transistor gates and p+-type guard-rings of increased doping were introduced for a wide use. Complying with this design rule makes radiation hard electronics possible using standard inherently radiation-soft processes. This is commonly used now for radiation hardened read-out circuits designed for the high energy physics experiments. The Figure2 (a) shows the principle of the radiation tolerant layout of an NMOS transistor with enclosed polysilicon gate and the use of a p+-type guard-ring protecting against leakage currents between n-type regions in the design (Figure2 (b) ). Figure 2. (a) Radiation tolerant layout of an NMOS transistor with enclosed polysilicon gate in CMOS process (p+ guard-ring is not shown), (b) layout of an n-well/p-sub diode with p+-type guard-ring protecting against leakage currents. At any Si-SiO2 interface there are numerous interface traps, which result from the strained or dangling silicon bonds at the boundary between the two materials. The density of the interface traps depends strongly on the processing parameters, such as oxidation temperature, and is usually in the range from 10^9 cm-2 to 10^10 cm-2. Ionizing radiation causes the density of these traps to increase and modifies their energy distribution, giving rise to radiation induced interface traps, hence new energy levels are introduced in the band gap at the Si-SiO2 interface. They play the role of additional acceptor or donor states, which under thermal equilibrium are charged. Trapped charges alter the electrical characteristics of the devices by modifying the electric fields inside. The energy levels close to the mid-gap may act as trapping centers for charge carriers generated by incident particles in the detector. This effect is observed as partial charge collection after irradiation. The charge carriers generated by an incident particle are blocked in trapping centers and are being released with some delay after the particle passage. The increased density of energy states in the band gap, which can act also as generation-recombination centers, increases the recombination velocity at interfaces. This effect translates primarily into an increased leakage current. For some detectors, the generation at the Si-SiO2 interface is the dominant source of a dark current. Read-out circuits suffer from the effect of positive charge build-up, the decreased carrier’s surface mobility and the high density of interface states with energy levels in the band gap. Due to the creation of new interface traps, both NMOS and PMOS transistors, suffer from the increase of absolute value of their threshold voltages. The increased density of the interface states has also an impact on flicker noise of the NMOS transistor which level is significantly higher compared to the PMOS device, and is further deteriorated after irradiation.